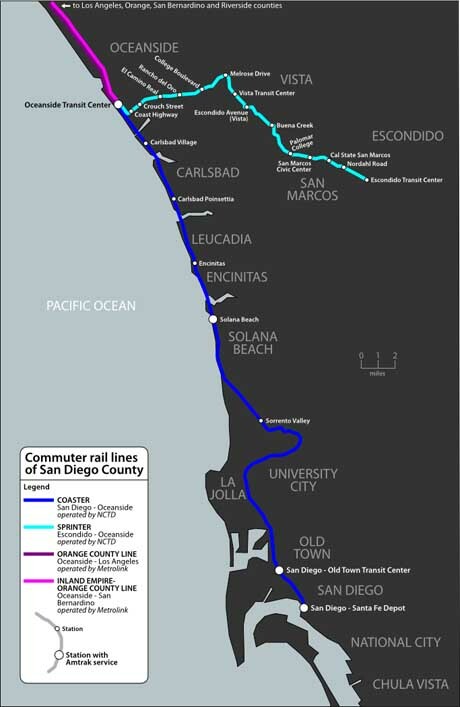 The COASTER commuter train runs north-south between Oceanside and Downtown San Diego. It is sometimes called "Coast Express Rail". The Coaster primarily serves commuters on weekday peak periods, but it does operate Friday and Saturday nights during the spring and summer. It also runs during the Padre's games from Monday to Thursday evenings. The Coaster does not run on Sundays. Besides being convenient for vacationing tourists, since the trains run along the coast, it is a great way to see the coastal scenery. 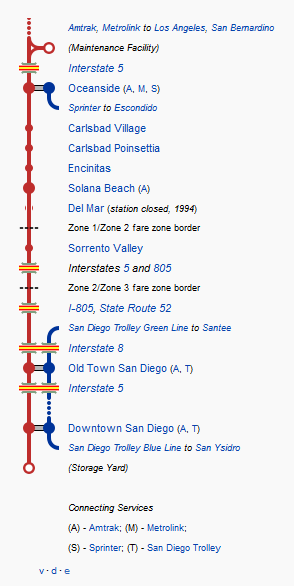 The entire north-south run between Oceanside and Downtown San Diego takes about an hour. Schedules and routes are always subject to change. Visit the Coaster website for the latest information, fees, station stops, connecting exchange points to other forms of San Diego CA public transportation and accessibility.